We are pleased to announce our new, Sit-Stand Workstation with infinite height adjustable ergonomic solutions that will fit in any work environment. Effortlessly adjusts from a primary work surface to a Sit Stand position with fingertip ease. With 22” of advanced gas assisted height adjustment range as well as an independent height adjustable mechanism for the keyboard tray with a below desk range of 7”. This makes the Sit- Stand workstation the only ANSI/BIFMA and HFES compliant product on the market and will work on both 24”or 30” deep work surfaces. 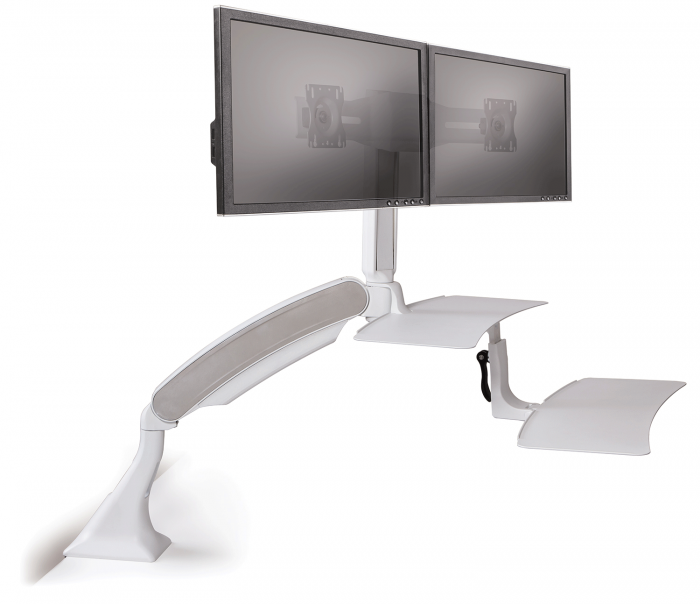 The Sit Stand Workstation is versatile enough to support a single monitor (KCS26000) or dual monitors (KCS26500) with either grommet or clamp mechanisms available (included with purchase). This unit will fit on the rear, corner or side of the work surface. 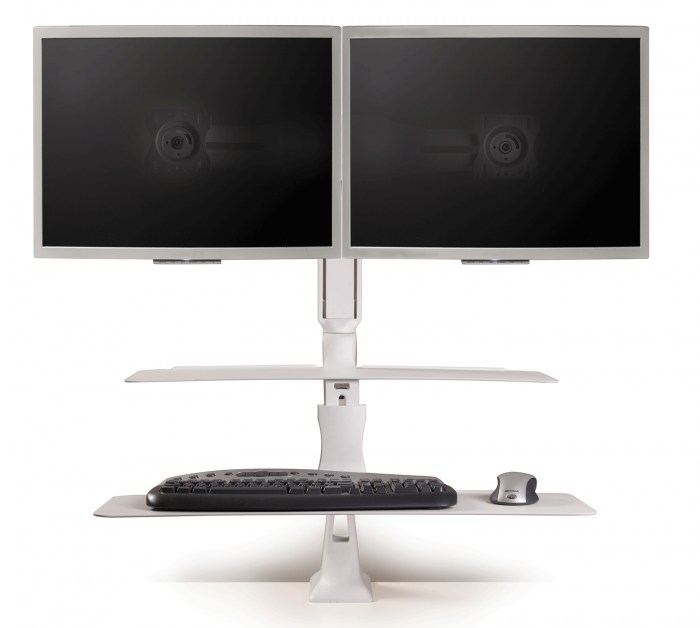 The height adjustable monitor tower, rotates, tilts and pans for the optimum viewing angles. It will support monitors up to 24” wide and up to 8 lbs. each. Made of steel and built to last. Earn up to 4.1 LEED C-1 credits with up to 54% recycled content and recyclability content of 99%; making this, one of the most environmentally friendly products of its kind. Includes a 5 year warranty and is TAA compliant. Some assembly is required, all tools are included. Product weight is 42 lbs. 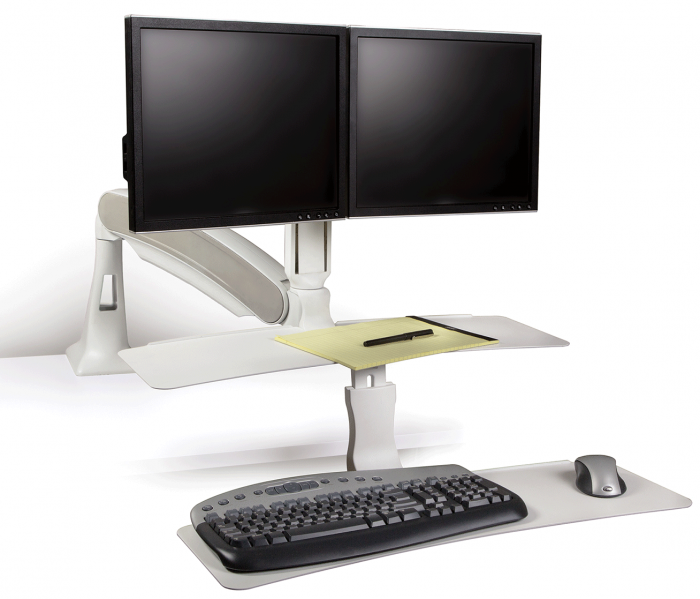 Additionally, our new Sit Stand Desktop Workstation(KCS95230) is intelligently designed for easy use and set up; comes preassembled. Enjoy the health benefits of a Sit Stand workstation with minimal effort. Side mounted paddles control the gas assisted handles for infinite height settings and with advanced technology; enabling the user to select the best ergonomic position for working with no pre-set positions. Large keyboard surface easily holds both a mouse and keyboard. The only Sit- Stand on the market that offers a keyboard surface that can be adjusted at either 10⁰ negative or 10⁰ positive angles. 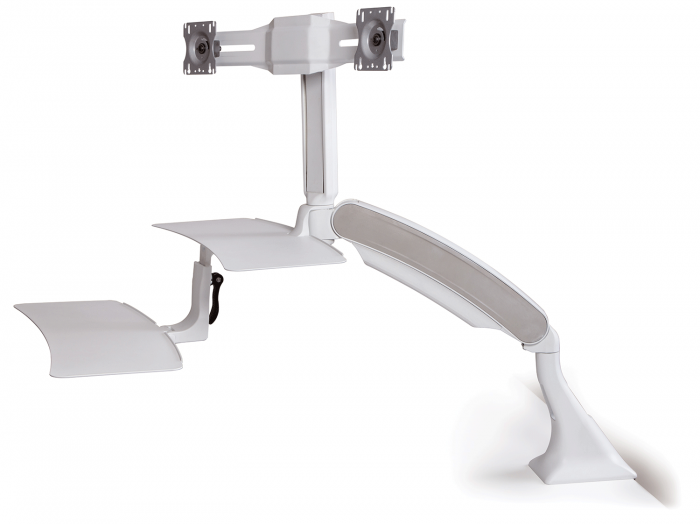 The ergonomically designed Sit-Stand Workstation allows for a free range of hand and wrist motion. Effortless, smooth and quick adjustments allow users to change positions in under three seconds. Unit can rise as high as 20” above the desk surface allowing users to alternate between seated and standing postures, reducing the risk of backache, pain, stress and tension. Large enough to accommodate two 24” wide monitors, discrete standard rear grommet hole is located in the rear of the work surface to support most monitor arms. Weighing less than 40 lbs. allows the unit to move from desk-to-desk. Easily fits on 24” deep work surfaces. No tools needed, just take it out of the box, place it on the desk and start working. 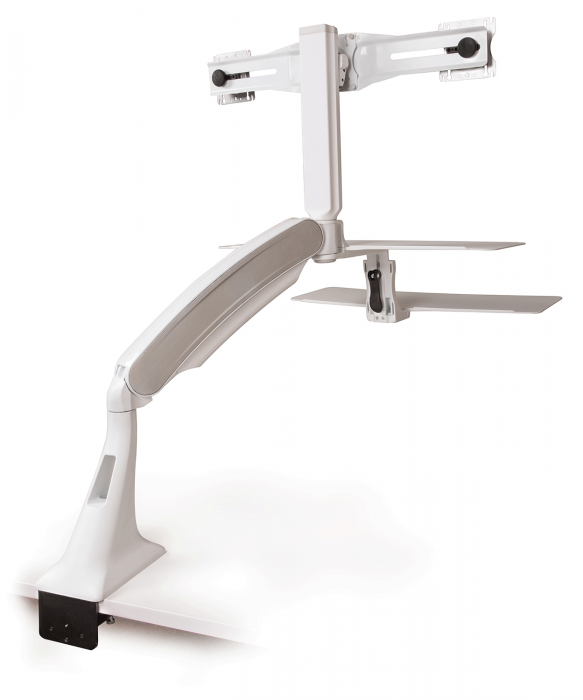 The Sit Stand Workstation can support up to 35 lb. with overall dimensions of 35.5”w X 23.5”d x 6.5”h when folded down. Includes a two year warranty. Product Net Weight: 42 lbs. Case 1 weight: 48 lbs.